For many shoppers, Jewelry TV is a good place to buy jewelry. It offers competitive pricing on quality jewelry, just like online jewelry auction sites do. The main difference is that you have a host to educate you about each piece of jewelry for sale. As a result, Jewelry TV can be a great way for relatively new jewelry shoppers to get an introduction to the world of jewelry. You can find great deals on Jewelry TV, and then take the knowledge you gain and use it to also look for deals at online jewelry auctions. If you’ve spent time browsing the Jewelry Room website, you will know that we had a thriving jewelry manufacturing business long before we expanded into online jewelry auctions. Our manufacturing business continues to partner with Jewelry TV to sell some of our pieces, so we know firsthand that Jewelry TV offers quality items every bit as good as what you would find in a retail store. Another reason you can trust Jewelry TV to provide quality jewelry is that they have a rigorous quality control process. Every time they receive a batch of jewelry from a supplier, they choose a few pieces for a random inspection. If any of the pieces fail, they will return the whole batch. Note that they are doing this for each batch, not each order. Because an order can contain many batches, this means more opportunities for inspections. Because Jewelry TV buys thousands of jewelry items at once, they can get bulk pricing from manufacturers and then pass these savings along to you. Their business model involves selling off huge quantities of jewelry relatively quickly, so it is in their best interests to always price the jewelry to move. You can expect that any price you see on Jewelry TV will offer tremendous savings over traditional retail stores. Jewelry TV often offers unique jewelry that you won’t find anywhere else. This includes celebrity-inspired and celebrity-designed jewelry. Stars like to partner with Jewelry TV because Jewelry TV can offer their line of jewelry great visibility by bringing it right to the living rooms of tons of eager shoppers. When you watch Jewelry TV, you can get the chance to buy fashionable jewelry just like the stars wear. Most retail stores limit themselves to traditionally popular gemstones like diamonds, rubies, emeralds, and sapphires. You might also find the full range of birthstone gems like peridot, pearl, citrine, aquamarine, amethyst, garnet, and opal, as well as stones like turquoise, jade, and onyx. But what you won’t find are specialty gems like morganite, moissanite, apatite, tourmaline, and fancy colored diamonds and sapphires. These unique gems simply don’t show up on jewelry store shelves. You can find them on Jewelry TV though! One of the biggest benefits of shopping on Jewelry TV is the level of detail present in their jewelry descriptions. Unlike online jewelry descriptions, which may contain just the bare minimum of facts about the jewelry, the Jewelry TV hosts will give you tons of information about the jewelry. They may discuss the style of the piece, as well as the quality of the materials. Watching Jewelry TV can really be a learning experience, where you gain a thorough gem and jewelry education. This is especially helpful on jewelry with unique stones that you may never have seen before. In addition to detailed descriptions, you will also get to take a close look at the jewelry from multiple angles as the hosts display the jewelry for the camera. This is a huge advantage over shopping online, where you often only get to see one view of the jewelry. If you want to find even more information about different gems and metals, you can access a learning library filled with helpful articles by visiting Jewelry TV’s website. The knowledge you gain there will empower you to evaluate jewelry prices on Jewelry TV, in retail jewelry stores, at online jewelry auctions, and anywhere else you shop for jewelry. Buying from Jewelry TV is extremely convenient. You don’t have to leave your home or even get dressed. Instead you can get an exciting shopping experience right from the comfort of your own home. And because the TV host can’t interact with you personally, there’s no danger of a pushy salesperson pressuring you to buy something you’re not 100 percent in love with. 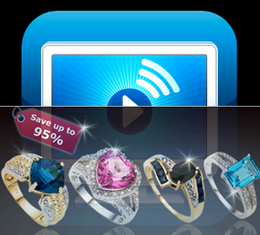 You can even watch Jewelry TV when you’re not at home, by streaming live video over the internet. While Jewelry TV does bring a lot of positive aspects to the jewelry shopping experience, there are some potential downsides. First of all, some people get too caught up in the moment and end up buying jewelry they don’t really need, just because they don’t want to miss their chance to buy before supplies run out. If you want to shop using Jewelry TV, make sure you have good self-control! Another downside is the fact that you don’t get to browse the items on your own, but instead have to look at whatever the hosts are displaying at the moment. So, for example, if you are shopping exclusively for earrings you might have to sit through a lot of ring and necklace descriptions before you get to the earrings you want. One last potential problem with shopping on Jewelry TV is the inability to ask questions and get personalized guidance about buying jewelry. You can get this guidance in person in a store, but of course you will end up paying more for it due to higher prices. In the end, whether or not Jewelry TV is a good place to buy jewelry depends on you. Your needs and your shopping habits will determine whether you should shop on Jewelry TV, in a retail store, or at an online jewelry auction. Why not explore all your options and then decide?